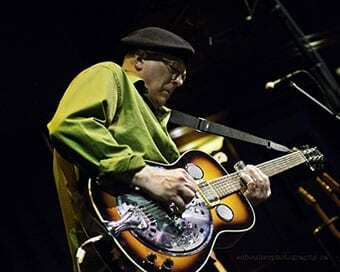 A master slide blues guitarist and songwriter, John Campbelljohn hails from Cape Breton Island, Nova Scotia, Canada. Over the course of his four decade-long career, John has won or been nominated for countless music awards including Maple Blues Awards, East Coast Music Awards, Real Blues Awards, Music Nova Scotia Entertainer Of The Year, Blues Recording Of The Year & Musician Of The Year. Now John combines the intimate stylings of his slide-blues solo performances with the hard driving, electric blues-rock rhythms of his band, to create John Campbelljohn DOUBLE DOWN BLUES. John’s long time music partner Neil Robertson adds drums, percussion and harmony vocals. This is an award winning power duo format, established by such groups as The White Stripes, The Black Keys and the legendary slide and steel guitarist David Lindley (Jackson Browne, Ry Cooder). John Campbelljohn’s sophisticated and progressive approach to songwriting gives him a distinctive edge, mixing rock, blues, reggae, and even celtic-blues into his signature style. The result is a sound that can pummel the audience into submission with blues power one minute, while soothing them with subtle National steel the next.